The first map of norhtern Syria produced from actual surveys. A Map of Part of Syria from an Actual Survey. An extremely uncommon 1754 map of Syria by Alexander Drummond. Most likely the earliest scientifically surveyed map of the interior of northern Syria. Oriented to the south, the map is roughly centered on Aleppo, where Drummond was stationed as British Consul. It extends over the areas the Drummond traveled and personally surveyed: westward to the Bay of Antioch (near modern day Hatay, Turkey) and east as far as the Euphrates River, an again north to the Sinus Issicus (modern day Gulf of Iskenderun). Inland the map extends further north to a city identified as Antaib, also known as Antiochia Penes Tarum, an ancient Roman city most likely corresponding to modern day Gaziantep or Antep, on the Turkey-Syria border. Drummond's map is remarkable in that he copies nothing from earlier works, taking great pains to map only those sites he has actually personally experienced and surveyed. Though some of his distances are skewed, Drummond's map represents a significant cartographic leap forward in the modern mapping of Syria. Despite the fact that Drummond's focus is the ruins of antiquity, his place names and location references are particularly thorough and important. This includes some of the earliest references to various Syrian villages, fortresses, churches, mills, roadways, and terrain. Drummond had a personal interest in Syrian Christianity and the detail with which he notes various churches throughout is of exceptional interest. The curious cartouche, in the upper left quadrant depicts a turbaned spear wielding slaver, possibly an Ottoman, and to his right, a depressed looking, scantily clad, chained slave. Drummond was a harsh critic of Ottoman rule and the message of the cartouche is clear, the slaver is the Ottoman Empire and the slave the oppressed people of Syria. Though the Ottoman Empire no longer controls Syria, parallels might be made to the region's current state of unrest. 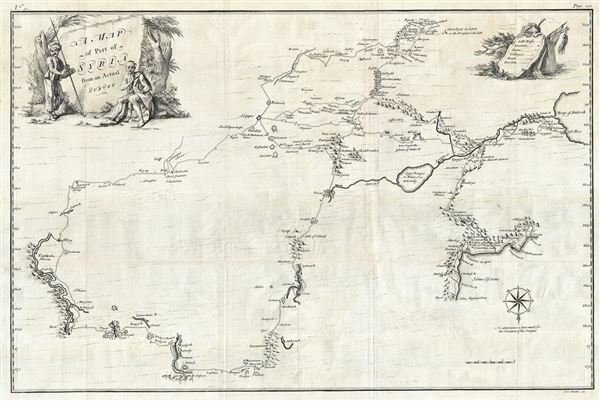 The map was engraved by Johann Sebastian Muller, also known as John Sebastian Miller, a German born by London based engraver. Muller was not specifically a map engraver or a cartographer, so we can surmise that much of the depth of this map stems from the fact that he made no effort to reconcile and embellish Drummond's manuscript map with known cartographic knowledge - as would have been the norm had Drummond passed the work on to an established English map engraver of the period such as Thomas Jefferys or Robert Sayer. Alexander Drummond (?? - August 9, 1769) was a Scottish diplomat active in the Middle East during the mid-18th century. Drummond was the son of George Drummond of Newton and the younger brother of George Drummond, Lord Provost of Edinburgh. Little is known of his early years but he seems to have traveled extensively in the 1740s before being commissioned as the British Consul at Aleppo, a position he occupied form 1754 to 1756. Drummond was an amateur surveyor and a student of antiquity. His few maps are generally of some significance, as many shed new light and incorporate original survey work on then little know parts of the world. His maps of Cyprus proved exceptionally influential and in the accompanying literature Drummond is among the first to recommend a British takeover of the island. He seems to have travelled extensively throughout Syria during this time and returned to England with some of the most sophisticated mappings of Syria then available - many of which he published in his journals. Drummond died in Edinburgh on August 9, 1769. Johann Sebastian Muller (1715 - June, 1792), also known as John Sebastian Miller, was a German born generalist engraver active in London during the middle part of the 18th century. Muller was born in Nuremberg, Germany. He must have shown little aptitude for his father's profession, gardening, instead training as an engraver under Martin Tyroff. He moved to London with his Brother, Tobias Muller (Miller) in 1744. He took work with art-dealer Arthur Pond before starting to engrave on his own account around 1748. His work was exhibited at the Society of Artists in 1767. Muller was not specifically a map engraver, and his cartographic corpus is, thus, small and limited to a series of map engraved for William Drummond to illustrate his travels in the Levant, specifically Cyprus and Syria. Nonetheless, the maps from this volume are significant works that significantly influenced subsequent cartography in their respective regions. Muller was survived by two sons, John Frederick Miller and James Miller, both of whom also became engravers. Drummond, A., Travels through the different Countries of Germany, Italy, Greece, and parts of Asia, as far as the Euphrates, (London: Strahan) 1754. Very good. Original fold lines visible. Original plate mark visible. Blank on verso.